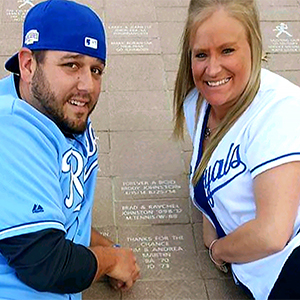 When a pair of former student-athletes lost their four-month-old son in 2014, they wanted to find a way to have his memory live on. One way Brad and Raychel (Boling) Johnston did that was by establishing the Brody Robert Johnston Memorial Athletic Scholarship. 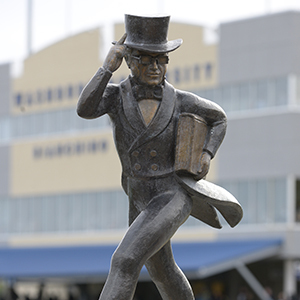 The endowed fund will provide scholarships for future Ichabod student-athletes. The two contribute annually to Washburn programs like the tennis team where Brad played and the women’s basketball team where Raychel played. They also purchased two bricks on Ichabod Plaza outside the Welcome Center with one for their son and one for them. The Johnston’s love for Washburn goes back to their days on the court. Brad was part of three MIAA tennis championship teams and four NCAA tournament teams from 2005-09. He earned all-MIAA all four years and is sixth in school history with 70 doubles wins. Raychel played basketball from 2008-11 and was part of one MIAA championship team and three NCAA tournament teams. Raychel has been a law enforcement agent with Kansas Alcoholic Beverage Control for seven years. Brad has been teaching for eight years and is a special education teacher with Topeka Public Schools. The two stay involved with Washburn by attending basketball and tennis matches as well as donor events. You can honor the memory of someone important to you by supporting the Ichabod Athletic Fund with a gift online. You can also contact Bruce Steinbrock by email or at 785.670.1334 to learn about creating an endowed scholarship or estate gift that will change student-athletes' lives for generations to come.